Compare Sewing Machines: Brother CS6000i, Singer 7258 or Michley LSS-505? So you have decided to buy a sewing machine, but you are a bit lost when you're faced with the multitude of options available. Manual or automatic? Purely mechanical or computerized? Features to look for? What brand? What price? The possibilities are almost endless! To simplify the task of zeroing fast on a machine that would respond adequately to your sewing needs without wasting too much time researching endlessly numerous brands and models, we will compare here the three portable sewing machines brands and models that were the most popular among Amazon customers at the time this review was written: Brother CS6000i, Singer 7258 and Michley LSS-505. Brother CS6000i and Singer 7258 are both computerized units, quite similar in the way they work and the features they offer, even though the Singer comes with slightly more automation, more built-in stitches and more types of presser feet. These machines are sophisticated enough to allow you to do most of the sewing tasks you will ever need including buttonholes, quilting and some embroidery. They are also priced quite similarly. On the other hand, the Michley LSS-505 is not computerized and is only partially automated. It offers very few built-in stitches and only one presser feet. Its popularity may be explained by its ability to execute certain basic sewing functions quite well, its ability to run also on batteries, and its much lower price. This review will compare the various aspects of the portable Brother CS6000i, Singer 7258 and Michley LSS-505 machines, so you may decide which would best respond to your own sewing needs. Note: If you are in a hurry and wish to see right away pricing information on these machines, just click the following images that show the prices and product information for the three machines. Note 1 The Amazon prices can change anytime. Please refer to the Amazon products section below for the exact prices of these sewing machines. Note that the Amazon Price usually includes a generous discount on the List Price. Note 2: The Amazon customer rating is the average of all ratings given by Amazon customers who bought the product and reviewed it. The rating is out of 5 stars. Note also that all three machines are portable and white (though Brother and Singer have some bluish trims). Note 1: With Michley you need to use the pedal to start and stop. On Brother CS6000i, you get 20 decorative, 20 garment construction, 7 quilting, 6 heirloom and 7 buttonhole programmed stitches (see image below). 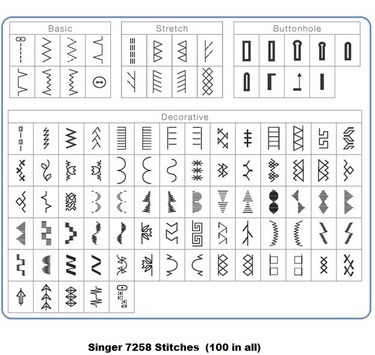 On Singer 7258, you get 9 basic, 8 stretch, 76 decorative, and 7 buttonhole programmed stitches (see image below). 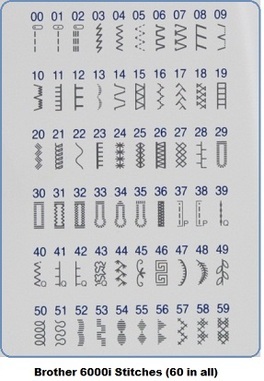 On Michley LSS-505, you just have 8 stitches (see image). Note 3: On Brother CS6000i and Singer 7258, with the touch of a button, you'll select your stitch, and then see the stitch you've chosen on the convenient LCD display screen. There is no LCD display on Michley LSS-505. Note 4: On Brother CS6000i and Singer 7258, you just choose the buttonhole setting, and then you place the button on the buttonhole foot. The machine does the rest in one single step. You get seven 1-step buttonhole stitches with both machines. The Michley does not have buttonhole stitches. With Singer 7258, you get 10 standard feet (all included): All-Purpose foot, Zipper foot , Buttonhole foot, Blind Hem foot, Satin Stitch foot, Overcasting foot, Darning / Freehand Embroidery foot, Gathering foot, Narrow Rolled Hem foot, Quarter Inch foot. With Michley, you get a single general purpose foot. Note 6: On Brother and Singer, you just push the conveniently located reverse stitch button to sew stitches in reverse. On Michely, a lever on the front can be held down to put the machine into reverse. Note 7: On Brother and Singer, optimal settings for length and width are automatically adjusted when choosing a stitch. They can be overridden to personalize length and width choice. Note 8: On Brother and Singer, needle position can be changed for individual projects, if required. Note 9: On Brother and Singer, you can program your machine to always stop with the needle in the down position or program it to always stop in the up position. The choice is yours and you can change this as needed based on the type of project you’re working on. Note 10: All three machines have twin needle capability, but only Brother CS6000i comes already with a twin needle included. With Singer and Michley, you need to buy the twin needle separately. Note 11: Quick-set top drop-in bobbin makes setting and accessing your bobbin thread a breeze. Also, transparent bobbin cover makes it easy to monitor thread supply. Note 12: On Brother and Singer, the automatic bobbin winder is super easy to use with its quick and reliable winding system. On Michely, there’s an automatic bobbin winder as well, but it’s not the most efficient. You might find yourself less frustrated if you buy a little SideWinder that can be used to wind your bobbins instead of fighting the one built into this machine. Note 13: Given the limited number of stitches it comes with, Mchely LSS-505 can only be used for introduction to quilting. So which sewing machine to buy? If you need a sewing machine for occasional minor projects or to introduce sewing to a novice, you may want to consider the Michley. But if you want to do regular projects of varied complications, we don't recommend this machine. It has a very small set of stitches which does not even include a buttonhole stitch. Don't even think of doing serious quilting or embroidery with it. Furthermore, if you are going to use your machine often, you want to get one that is automated as much as possible, so you don't get frustrated with operations such as manual needle threading. There are two factors that make the Michley quite popular in spite of the negatives just mentioned: The low price and its ability to run also on batteries which may be useful when you are traveling on an RV or if you are staying somewhere where no power is available, such as a country cottage. For regular sewing and multiple projects including buttonhole stitching and quilting, you should definitely consider either Brother CS6000i or Singer 7258. 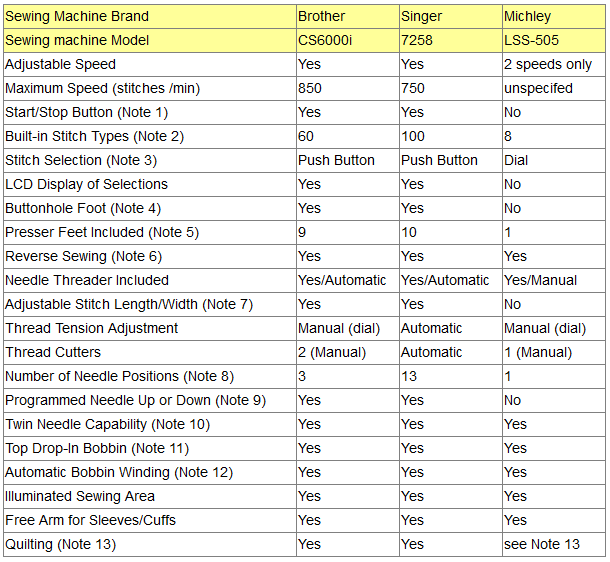 The Amazon prices for Brother CS6000i and Singer 7258 are quite similar, they are both computerized and equipped with LCD displays of selections, and they offer similar features though one can find a higher degree of automation on Singer which comes also with more built-in stitches and more pressure feet than Brother. On the other hand, Brother can do more stitches per minute than Singer (850 stitches per minute for Brother as opposed to 750 for Singer). For embroidery you should consider Singer 7258, though another Brother machine, Brother SE400, can be considered for embroidery (see below for information on Brother SE400). Finally, note that, at the time this article was written, both machines had received an average rating of 4.5 stars (out of 5) from Amazon customer. Comprehensive sewing and quilting functions, plus 4-inch-by-4-inch embroidery capabilities. Intuitive LCD screen display, built-in tutorials, and quick start guide. Accesses to a full range of sewing features, with 67 sewing stitches and 98 stitch functions. Ability to embellish home décor, clothing and gifts with its included 4”x4” embroidery capabilities. Choose from the built-in embroidery design library of 70 decorative designs, 120 frame pattern combinations and 5 lettering fonts, or import designs from your PC. Computer connectivity for importing thousands of embroidery designs (purchased from iBroidery.com and other sites), and for updating your machines features in the future. One-touch automatic thread cutter that cuts your top and bobbin thread with ease. ​25-year limited warranty and free phone support for the life of the product! ​Note that the manufacturer does not recommend using this machine in countries that do not support 120V AC even if a voltage adapter is in use. ​Please note that at the the this articlee was written, this machine had received an average rating of 4.5 stars (out of 5 stars) from Amazon customers and that is the Best Seller in the Amazon Embroidery Machines category.